The rain and mild conditions has stimulated grass growth, and most now have satisfactory covers and will be planning for some harvesting of early silage. Advisers suggest 40 days shut up for silage is the target for quality feed, but often the weather intervenes, delays contractors and the product suffers. Irrigators are now seen watering everywhere in Canterbury as managers look to keep the pasture momentum going, and ensure soil moisture levels are maintained. 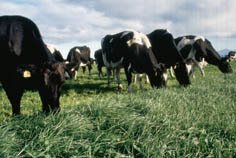 Rotation lengths in the north under strong grass growth are now at 18-20 days as managers strive to keep pastures short and of such quality, that maximum milk flows are maintained for as long as possible. Tail painting, heat detectors and visible assessment are being used to detect oestrus ready for mating management that should help in a tight fertile calving next year. Much interest is building in Septembers production figures, as with such a mild and growthy spring especially in the North Island, milk flows could be ahead of what the market expects, and it will be interesting to see how it reacts. And the auction did react downwards last night as it fell by 3%, with whole milk powder falling again to now drop US$112/tonne since it's recent high a month ago, and some farmers are nervous the market is following a similar trend as it did a year ago. But overall the market continues to firm, lead by Tatua’s excellent 2015/16 result of $6.30/kg ms, and more lifts in Oceania milk commodity prices that now show yearly highs for cheese, butter, and skim milk powders. Rabobank has also upgraded its forecast to now join the ASB in predicting $6 for this season, and these levels will give farmers optimism for returning to profits. Forward delivery dairy cows have increased in price and are now being offered in the $1800-$2000/hd range. Westland have formed a joint venture deal with leading infant milk formula company, Ausnutrica, to build a blending and canning plant at Rolleston, and improve the added value component in it’s products. A ship has been prevented from entering port at Napier as it's potentially contaminated cargo of pke could cause a biosecurity risk, as MPI officials believe the material is not from a legitamate source.